Win your title in one of our stunning pageant dresses. Prom Dress Shop offers a wide selection of worthy winning pageant gowns from coveted designers like Rachel Allan's Prima Donna collection and MoriLee to name a few. Our gorgeous pageant dresses are anything but dull, and showcase some of the most sought-after features. Long trains add the dramatic touch to your pageant dress whether you want want a figure hugging mermaid with a multi colored tulle skirt. Accentuate your long legs with a killer thigh high slit from slim sheath silhouettes to fully sequin ensembles that will make you shine from any angle on stage. Make a memorable impression in a striking color from crisp clean white lace full length gowns to bold red jersey dresses with breathtaking open backs. Pair your pageant dress with the right accessories to complete your runway ready look. 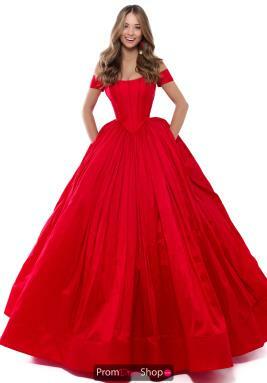 Order the perfect pageant gown today and pay no tax(outside IL)!